Just because its winter here in Swellendam and therefore very romantic with gusty windy and shards of dappled light, it feels like the perfect time for a little baroque levity with a dollop of tragedy at the end to break your heart. Despite its brevity, Purcell’s Dido and Aeneas holds many charms for audience and performers alike, so it’s no wonder that there has recently been something of a boomlet in recordings and reissues and it doesn’t hurt that this mini-sized opera fits easily on one disc. There are pleasures everywhere you listen in this recording. The overture, when it reaches its allegro, burns at breakneck speed, played with total control by Le Concert d’Astrée, the early instrument group founded and directed by Emmanuelle Haïm. She maintains the fast pace throughout the performance; at 53 minutes, this must be the fastest D&A on record. These tempos impart tremendous energy to the opera and are consistent with the furious passions that soak the story. For Dido’s death scene at the end of Act III, Haïm creates a wonderfully dramatic effect by radically slowing the tempo, as if the emotionally exhausted Dido has no more passion to give. It’s a perfect demonstration of Haïm’s global conception of the opera. 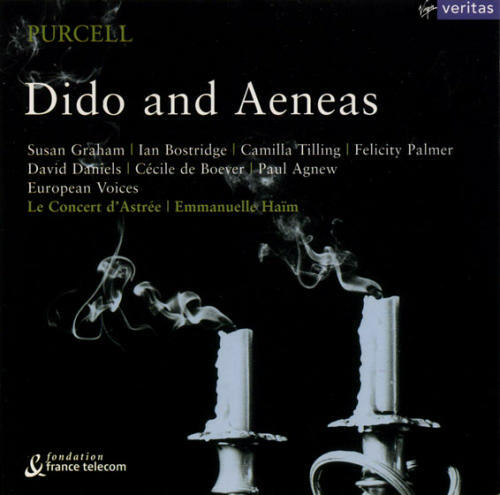 Dido and Aeneas is usually performed by a large string ensemble, but here Haïm discreetly doubles some of the parts with oboes, a bassoon, and in the Witches’ Dance in Act II, a recorder. The continuo makes heavy use of the theorbo, whose strummed accompaniment reinforces Haïm’s energetic tempos. By emphasizing downbeats — as in the heavy accents in the guitar ground dance (Act II, Scene ii) — Haïm reminds us how important dancing was in early opera — and why that Chelsea dancing master may have been interested in staging Dido and Aeneas to begin with. There is not a weak voice or a miscalculated performance anywhere on this disc. Mezzo-soprano Susan Graham sings Dido with total passion and understanding. The famous aria and the touchstone for a successful Dido is her final lament, “When I am laid in earth.” Janet Baker set the benchmark so high for it in her renowned 1962 performance (London) that no one has ever rivaled it. But listening to them side by side, one could argue that Graham, who sings with heartbreaking pathos, has finally surpassed her. Camilla Tilling sings the part of Dido’s handmaid, Belinda and is the eternal optimist of the piece, never grasping how inevitable is the lovers’ collision course with fate. Tilling’s vocalism always catches this naiveté. The recording is beautifully engineered, with a spacious sense of the stage, excellent separation of the various voices, and crystal-clear articulation from the softest passages to the blasting “thunder and lightning” and demonic hoopla at the end of Act II, Scene ii. A protégé of early music maestro William Christie, Emmanuelle Haïm has lately been popping up on covers and in articles in all sorts of music magazines. The virtuoso performances she gets from everyone involved in this recording demonstrate that this notice is by no means misplaced celebrity. She has given us an unsurpassed Dido and Aeneas.